Hi guys! Two things today, and two things only: First, I need to ask your opinion about something very important. And: I’ve got a pretty astounding chicken-feeding technique that is going to thrill you to pieces. So let’s proceed, shall we? I’ll try not to waver off of this path. Two things. That’s all. 🙂 Short and sweet. Mama Lulu is just puffed up with pride, and I don’t blame her a bit! Check out those cute little orange feet! The chicks are growing up too quickly, as chicks are wont to do. Bryan made a casual comment the other night at the dinner table. You know, one of those casual comments made, which is followed by a quick glance to the hearer’s face, in this case–mine. He wondered: what would my reaction be? Yup. You know what I’m talking about. And my answering comment caused him to–well, not to gasp (he’s not the gasping sort)–but at least to open his eyes wide in surprise. Bryan was so astonished by this conversation, that he didn’t say another word for a solid 5 minutes. Possibly, 6. And that’s something. (The following sentence is meant for you, Gentle Readers, and you alone: nearly all of my children are very talented in the talking-constantly-department, and they didn’t get that gift from me, if you know what I mean.) Now, returning to your previously scheduled programming . . . I went out, afterwards, to take a better look at the chicks, to ascertain just why Bryan thought they were so homely, and why (not at all me-like) I agreed with him, for heaven’s sake. AND I took my camera with the telephoto lens along, to take some pictures. I felt just a smidgen guilty, after all, in casting a negative light on these little mavericks. I smile every time I see them, after all. And that’s something, too. It’s really quite wonderful, that something so casual and small and lively and unexpected, can lighten a person’s day so effortlessly, don’t you think? Those little chicks just fill my bucket, do you know what I mean? When I go outside and see that dock weed that I still haven’t cut down, and the GMO corn being sprayed all around our place, and the dead little trees that got poisoned from something the farmer put on his treeline, and the not-telling-how-many* tomato cages that I still need to put up before my tomatoes droop and break, my bucket gets emptied. But then I see those chicks racing through the long grass, all bent over and moving so quickly on their dear little orange legs, and my bucket gets refilled. Especially if our big old black lab, Ollie, is sitting there watching them. Or if little Mack is giggling and laughing anywhere near. This bucket filling is vital, and it all depends on if you focus on the negative or the positive. And those little chicks, ugly or not, are the positive. And see, even from the side and back: Cute–cute–cute. Check out those dainty orange feet. And aren’t they adorable from the backside? I think they are having a quick chick meeting here. So sweet. 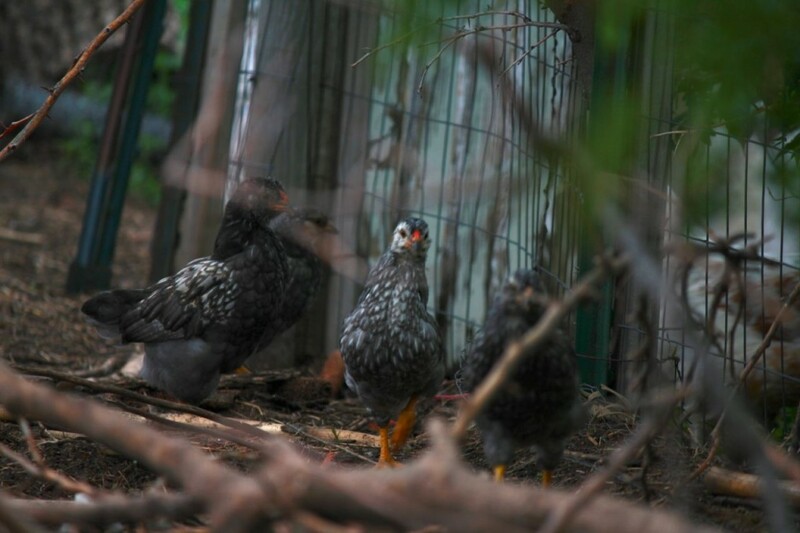 You can see the silver laced Wyandotte papa in this one. So CUTE. 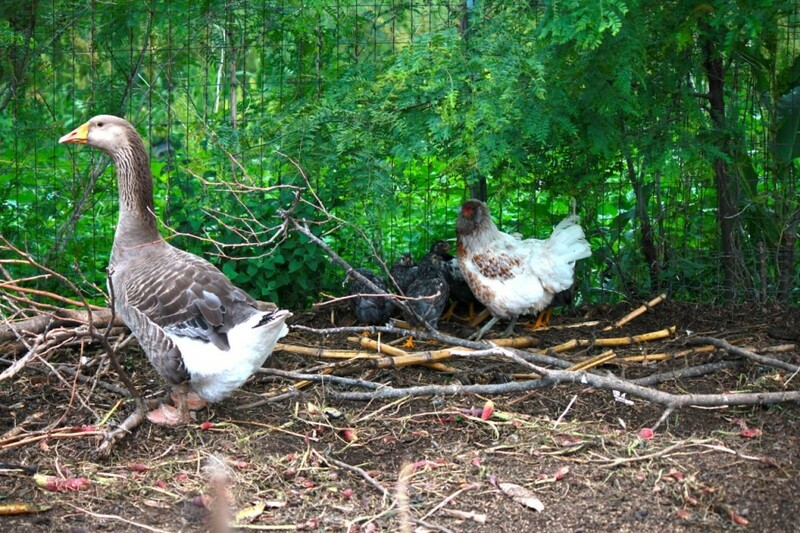 And this is, quite possibly, even cuter: whenever our goose, Lucy, can swing it, she hangs out with Lulu and the chicks. When Lulu takes off after a flying bug or something, Lucy stays behind to watch the chicks. I think she fancies herself the favored auntie, or perhaps the nanny of the family. Lulu is certainly a blessed mama hen in this regard. Gosh, I could have used a faithful nanny to watch over the babies for a few minutes now and then, when I had several in the house at one time. You know? Second thing: I started soaking the grains that I buy for my chickens this winter. I wrote about it, too. Would you believe it, I’m still at it. It’s not much trouble, and it increases the nutrition of the grains, and the chickens eat the soaked and sprouted grains better than the original dry, hard grain. In fact, they usually clean up every bit. But there are days when I throw out a bit too much, and there is leftover grain lying on the ground of the chicken yard the next day. And it tends to stay there a good long time. I don’t blame my chooks for wanting to eat the freshly-soaked grains, not the hardened, dirty ones left over from the day before. Do you? Even chickens have standards. 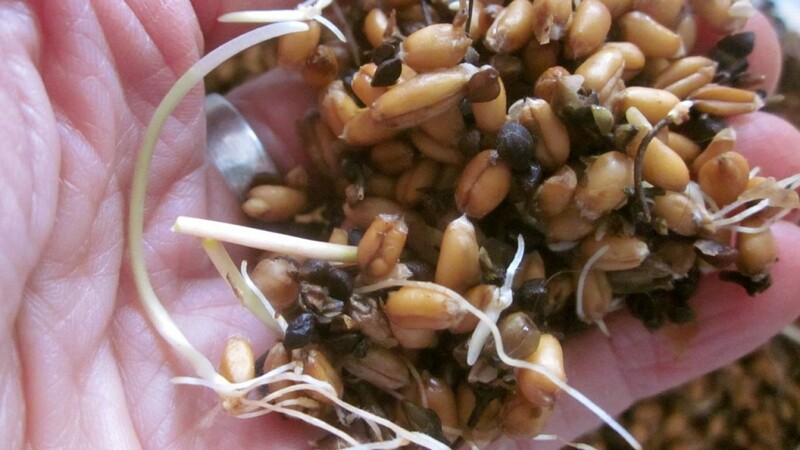 Here are the soaked grains, after a couple days in the sprouting bucket: swollen, fat, and sprouting! They look tasty, even to me! That might be fun to tweet, eh? After all, even chickens have standards. There were days when I’d look at that leftover grain, and cluck my tongue. I hate waste, don’t you? As a child (you can agree with this or not, but this is the way my generation was raised) I was urged to belong to the “Clean Plate Club” and to finish every bit of my dinner. So I’d gently urge my chooks to clean up their plates, in essence, and the next day I’d feed them less grain. But still the leftover grains would stay on the ground. And then, one morning, I noticed a very, very cool thing. I think I even gasped in wonder. Involuntarily. I think I also was filled with a kind of chicken-feeding joy of discovery. You know that joy, right? Please tell me that you do. It’s a wondrous kind of joy. The chicken yard has been bare of growth, except for the occasional weed, for years. I don’t like that, but the chickens (though they free range a good portion of each day) pounce on and eat anything that comes up in the chicken yard that is green. But. On this day, there was a dainty carpet of fresh green, growing . . . where the leftover grains had been . . . I gasped. (See above*) I grinned. I almost did a whoop of joy. Do you know what it was? It was those leftover grains, sprouting and growing. Growing something fresh and green, for my chickens to eat. With absolutely no attention from me. I had unwittingly produced a bit of self-sustaining chicken forage, Gentle Readers! Soak grains (mine are assorted grains, mostly barley and rye, that haven’t been heated and so, therefore, they are capable of growing) in a bucket of water for 24 hours. 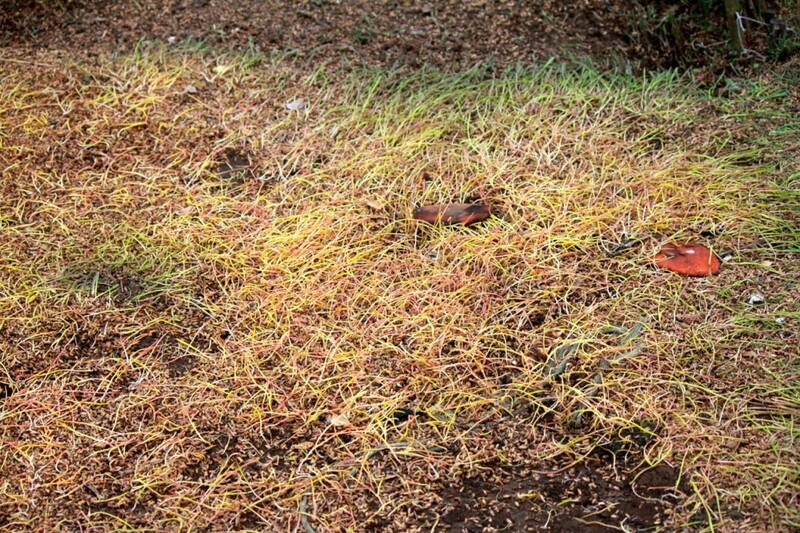 Throw grains out on the ground, and spread about in a single layer(ish). Cover with a large piece of cardboard. Pray for rain. In lieu of that, keep cardboard damp(ish) for a few days. In the foreground of the next picture, you see what’s happening with the grains growing. Underneath the cardboard is a new batch of grains growing. Cool, eh? See why I gasped now? Here’s what the sprouted grains look like, when I first removed the cardboard: Luscious, by all accounts, to chickens. Heck, it looks a bit tasty to me! So that’s it, my Gentle Readers. My two cool chicken-related things, nicely strung out into a very long post, indeed. *sigh* I don’t think I can write a short post to save my life. Hey! 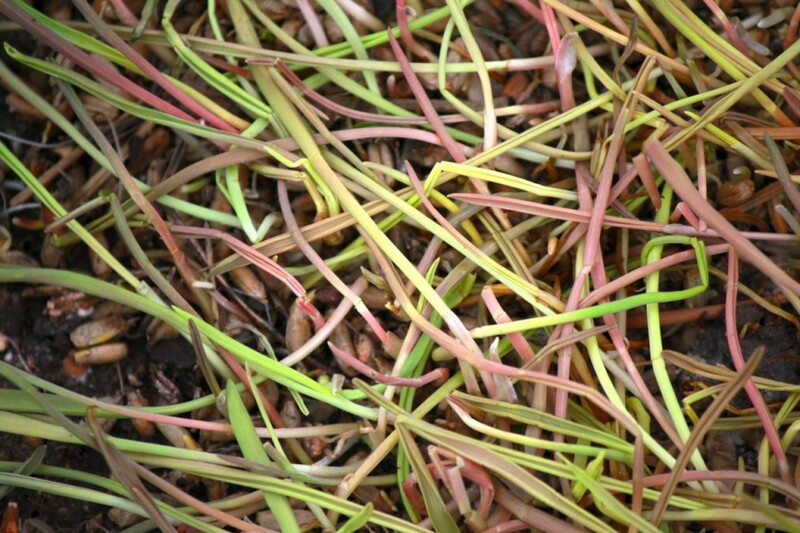 I need your input: have you ever heard of growing grains this way in the chicken yard? And (most important, indeed) do you think those chicks are ugly? ALSO: don’t forget that I’m running a giveaway, for a really amazing garden drip-tape system, kindly donated by the nice folks at Dripworks. Be sure to enter! One-more-thing: I’ll be sharing this post with the fun kindred spirits over at The Prairie Homestead, that bastion of self-sustaining living. Come on over! Definitely, the chicks are cute. My friend who gets day-olds every year, has been known to say, “they’re at the ugly stage” often, then I look and I don’t see it. I have only two hens left from my original 5 from 3 years ago. One went broody this spring. First I thought she’d get over it. That’s happened before, but not this time. I’ve taken the nest box out but she sits where it was. I’ve closed the hen house during the day but she sits morosely outside the door. And there were no eggs. So, finally after about a month, I’ve given her fertilized eggs to sit on. I opened the door to her nest and after a non-welcoming squawk, she looked around at the eggs I was pushing under her and said, “Yes, they were sticking out. I will tuck them in. Thank you.” In another couple of weeks I will have a momma accompanying her babies around the yard. There’s only one other chicken, so I figure she’ll be able to keep them safe. Fingers crossed. I’ll keep control of the cats and dog. I am SO looking forward to this. It may be a once in a lifetime thing for me. Oh Rita, I hope it works out for you and your mama hen, and I also hope that it’s NOT a once in a lifetime thing! It’s too much fun! Chicks are never ugly except maybe Naked Necks, but man those are some orange feet! Uglyj?! No by a long shot, I say. Of course they aren’t ugly. On a scale of 1-10, I would rank them an 11 for cuteness. Have you ever seen an ugly chicken – or chickie baby? Never. I love it that they look like Daddy, the Wyandotte, but my heart has a special place for the Ameraucanas. I just love them to death. 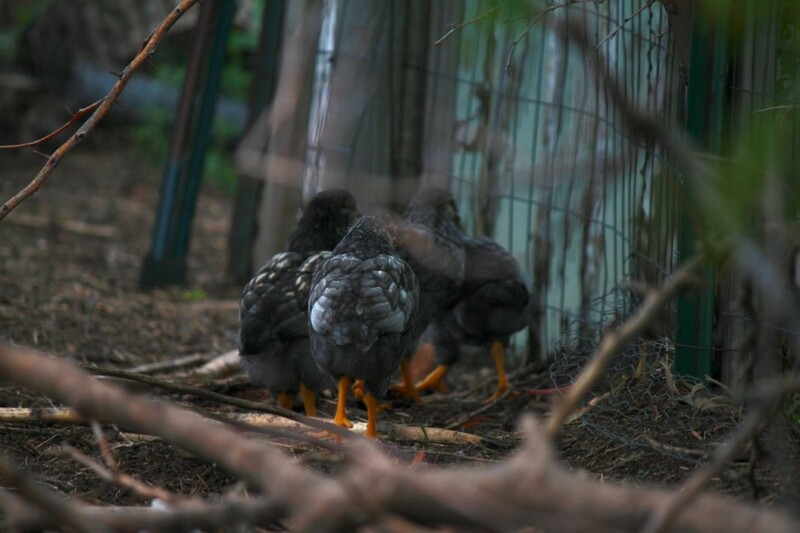 I think if I were to get more chickens (which I will as soon as I get a new hen house/yard finished one of these days), it will include more Ameraucanas. Now I wonder if they will lay green eggs or brown eggs. That will be fun to watch. Some of them may be boys. Then what? Do you keep boys or are they for the pot? BTW, where did those orange legs come from? I have never seen a chicken whose legs are so intensely orange! Love them, love them! They look like a goose or duck! So far as the sprouts go, I think it must be the weather. 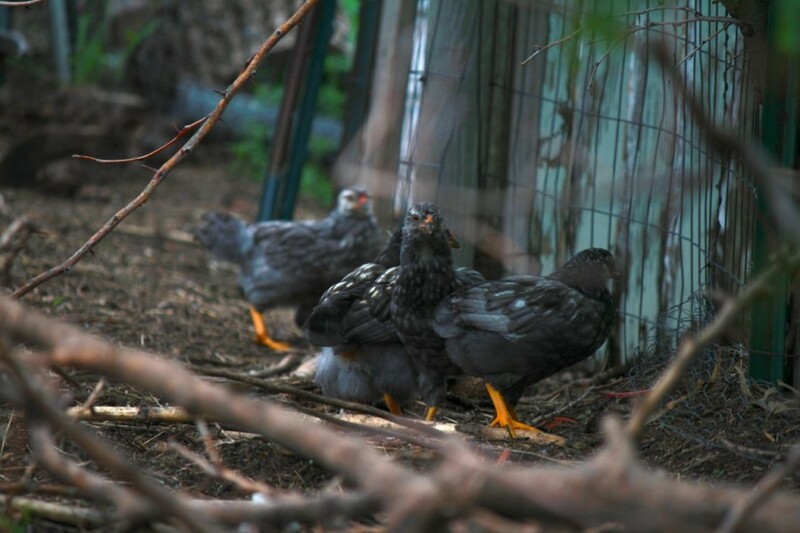 In my bare chicken’s yard, there are all kinds of green grasses coming up – and the chickens just leave it there and ignore it. I think they like the idea of something in their area that is different than bare brown dirt! …and yes, I have two things in the yard that I move around constantly – actually three – and the chickens go crazy when I move them around. I do it to keep control of the bugs that hibernate under there. It is fiesta time when I move the stuff around. I love it that chickens are so easily amused! It is better than a Sunday School picnic, when the yard stuff is shifted. 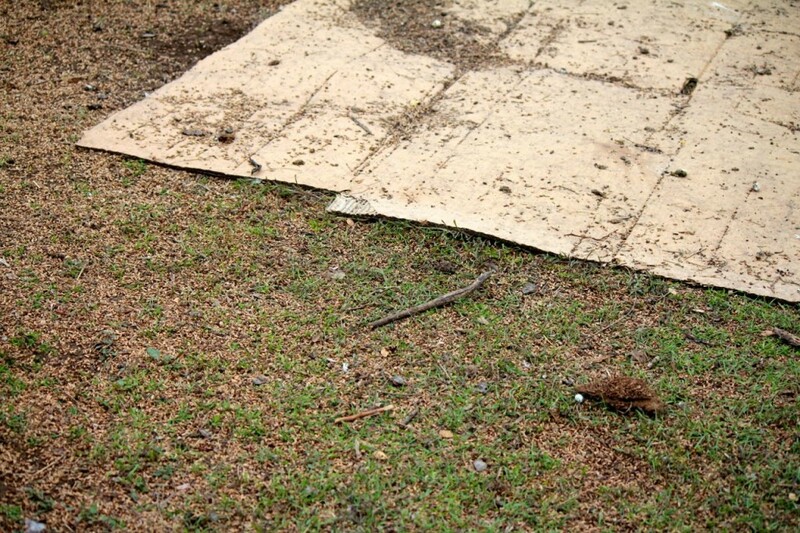 There are bugs, sprouts, and fresh dirt under there. Yippee, says the girls! Oh Mari, I love you. I wish we were neighbors. Of course we’d probably not get any work done, we’d just be yakkin’ up a storm. I don’t know where those crazy little orange feet came from–I guess from the papa! You can see that Mama Lulu has blue feet, but every one of those babies has orange feet! And I like hearing about your chicken yard. It sounds a lot like mine. Amazing, really–I just piled all kinds of stuff (branches, brush, weeds, etc.) in the yard last fall, trying for a permanent mulch pile for the chooks, but they really work it down to the ground, working up the bugs and the weeds and so forth. You’d never know, now, that I piled anything in there. I’ve got a pile of wet cardboard that I think I’ll put in there today, and see what they do with that. 😉 Oh–about the male chicks–I’ll only tell you this, but I only need so many roosters. So the boys will end up in the soup pot, once they’re grown. But that will be awhile before that happens! Any chicks are cute. They may be a bit unbeautiful on the outside but they are so cute on the inside it just spills over. I am looking forward to the day when I can have a nursery and raise some chicks of my own. They are ADORABLE! Everyone knows that the Ugly Duckling grows into its feathers. These chicks are adorable! I’ve seen some like these in the neighborhood where i live. I love how they are darker than usual. VEry cute, indeed! The chicks are so sweet; they’re not ugly at all! They look like they’re having fun! All baby animals are cute. A scientist will tell us all why babies are cute (maybe so that we won’t kill them after 6 hours of nonstop crying, for example) but the fact remains, chicks are babies and therefore cute. No, I have never seen chicks that aren’t cute. Even when they are competing to rip apart an unfortunate grasshopper that has come too close. But I thought your sprouted grain accidental discover was even cuter. If only I had known that 30 years ago. What a wonderful idea! It’s fun to discover something new, especially something that benefits the chickens so much and cuts down on my workload, too. And I agree with you about the cuteness of babies. That’s why, I suppose, we always have too many cats, and have too many dogs, and (honestly) TOO MANY CHICKENS! I have another hen who is sitting on eggs, due to hatch in a couple of weeks. Though our coop is a little full, I’m rooting for her. 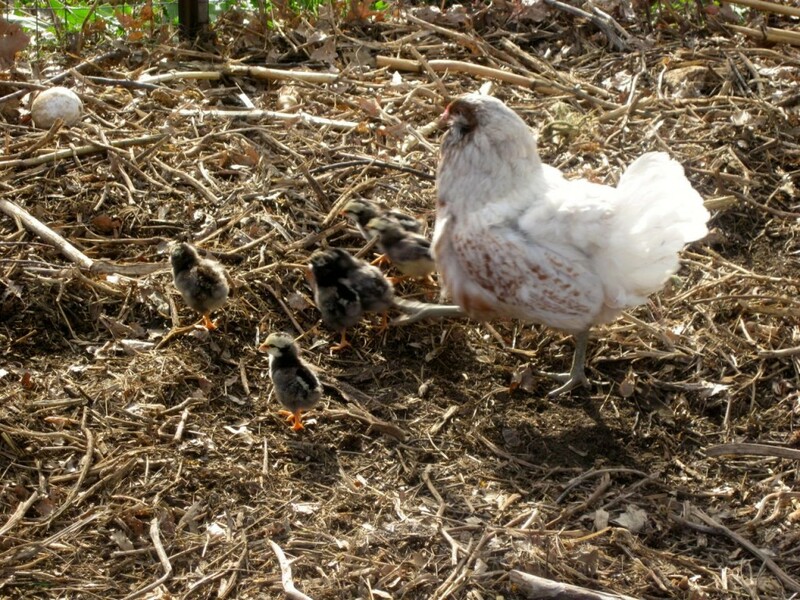 Watching a mama hen with babies is just so much fun. So, who cares if chicks are ugly or not? Are you planning to marry them? Of course not. You only care if they lay eggs, behave, procreate, and are worth your time- and on those counts, you win. Ah well, here in the Midwest, Roy, our eyes crave BEAUTY, in our chickens and elsewhere. Oh, how I love to see your chicks! It remainds me of the farm that I’ve grew up back home. Every year I had a favorite chick which was obviously raised by me and only me. The chick followed me everywhere, we had quite some adventures together. I am missing those times. My dream is to have my own farm some day full of animals. Your chicks are so cute, just look at those orange paws (my grandma use to say that orange paws are a sign of health at chickens), it is so rare to see that nowadays. I’ve never heard that about the orange feet being a symbol of chicken health! That’s very interesting. It sounds like you had a wonderful childhood experience with that beloved chick! I am really enjoying your chicken antics. We just hatched 3 little suburban chickens and my daughters are having a blast with them. Daisy, Buttercup, and Orchid are just the lovelies of things (although I am suspecting Orchid may not be a hen after all? ) So my question is….how can you tell? They are 2 months old now…. Regarding sexing chickens . . you can’t tell, until . . you can tell! After keeping chickens for 15+ years, I can tell fairly early which is which, but sometimes it’s hard to tell until the boys start crowing! In general, though, your young roos will have a leaner look and longer legs–and will be more aggressive, even as youngsters. Hope that helps!